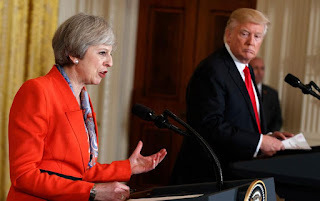 British Prime Minister Theresa May speaks during a news conference with President Donald Trump in the East Room of the White House in Washington, Friday, Jan. 27, 2017. WASHINGTON (AP) — One week into office, President Donald Trump was trying to clean up his first international incident. The president shifted a jam-packed schedule Friday to make room for an hourlong phone call with Mexican President Enrique Pena Nieto, who had abruptly snubbed the new president by canceling a visit. Trump's team had appeared to respond by threatening a hefty border tax on Mexican imports. Administration officials and diplomats insisted on anonymity to disclose private dealings with the White House. Kushner and Bannon have been heavily involved in the Trump administration's early dealings with some European partners, leading during both phone calls and in-person meetings with diplomats and government officials. Trump did little to ease anxieties Friday when he pointedly refused to say whether he planned to keep in place economic sanctions on Russia as punishment for its provocations in Ukraine. "We'll see what happens," Trump said during a news conference with British Prime Minister Theresa May. The readouts released by the two countries after Friday's call pointed to the work to be done. A statement from Mexico said the presidents agreed "to no longer speak publicly" about their dispute over payment for the border wall. The White House statement made no such promise.